My research is on robot design and looking at the ways in which the functions and applications of intellectual machines can be recognized. Thus the exterior design of such technologies must convey visually the information system within. The rapid evolution of technology necessitates an even more sophisticated approach to the visual design system in order for the project identity to become instantly recognizable. The power of design to integrate into our cognitive functions meaning is achieved by the suggestion of form. The sophistication of intelligence is achieved through the symbiosis of art and science and the role in which design plays to enhance the beauty of the other. Robot design. Once the domain of SF movies and books; it will soon enter into the everyday vernacular as recent advancements in artificial intelligence research and robot engineering have edged these technologies out of rarely known research institutes and into the glare of consumer life. The conversion from it's humbler roots in factory automation to that of a coveted consumer product was realized when SONY CORP launched AIBO(ERS--110) in 1999. Early robot prototypes were merely an assemblage of parts and substantial design was not carried out until further advancements in their sensors and mobile parts made its overall design imperative to the accuracy of its functions. Previously, a lack of mobility and autonomy in movement relegated the robot's function most suitable to the enterprise of mass production. A robot with independence of movement and a capability to act autonomously in accordance to its recognition of objects and surroundings has until now been developed for research purposes only. Thus design has played a minimal role at best until these recent advancements in the subtler aspects of robot function has called into question the degree to which design, specifically appearance has on the overall accuracy, particularly in movement. 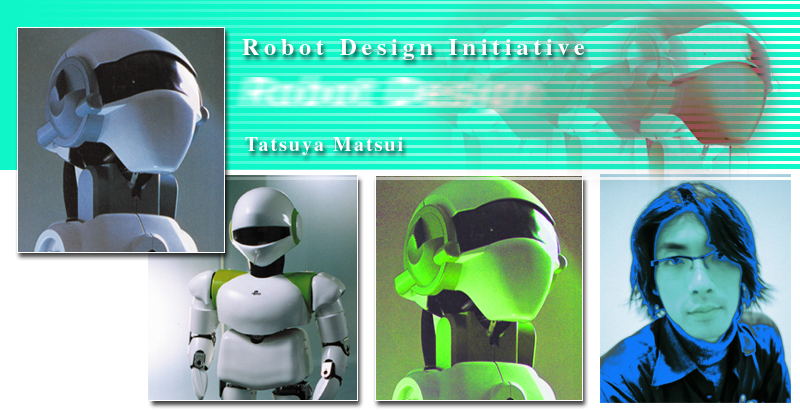 Design is now being recognized as instrumental to all aspects of robot development. As robot technology expands into the field of entertainment, the degree to which appearance imparts its desirability as a product is yet another challenge faced by the designer. Similarly, the conversion period of the personal computer (PC) from an object of industry to a home entertainment unit was accomplished in part by the role design played in promoting its attractiveness as a consumer product. The success of APPLE 2 best exemplifies the contributions design has made to convert industrial products into general use by a consuming public. With the humanoid robot under development as our project in mind, we advocate the establishment of a new field called robot design. Robot Design as a new field in the industrial design. Industrial design as it exists today, is the design of fundamentally static objects. The structure itself hardly changes. The automobile, an object whose function is movement is still designed as a static object despite having potentially several mobile parts. A door, for example, is intended to be manipulated by the user and not designed with a cognitively autonomous target in mind. The freedom of movement afforded by a robot differs fundamentally from the staticity of existing industrial products. The continuance of movement with its plural mobile parts presents several obstacles in pursuit of form amid these restrictions. As in the case of all industrial products design must be realized amid severely restrictive conditions. The body of a Formula 1 racing car is realized on the basis of aerodynamics, engine installation and so on. These restrictions are even more conspicuous in the case of robot design. Hollywood versions of robots like C3P0 of the Star Wars saga are visual simulations of imagined mechanical functions, free of these restraints. In the case of the robot, generally the mobile parts serve the same function as the motor and oil pressure system. The highly developed running gear has not yet been developed small enough to accommodate the kind of robot that appears in the work of science fiction. We need to recognize that robot design is not simply the design of an object but the design of a whole range of dynamics. Copyright (C)2000 Tatsuya Matsui@IRoDA Copyright All Rights Reserved.